I as a photographer always feel that I am left out when taking photos of others - as everyone wants to have him/herself included in each and every photos, and no one takes a pity on the photographer by taking his camera and including him in at least one of the photos. And even if some does, then the group is never complete with the one taking the photos. 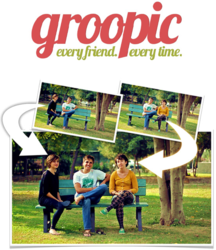 A Lahore based Pakistani developers have the answer: Groopic - the smartphone App that can have you included in most of the photos. Finally, this app will automatically merge these incomplete pictures into one complete group picture. Groopic has been developed by EyeDeus Lab’s team using patent pending technology and readily, just from its beginning, it grounded its sensation’s flag by getting coverage over international tech blogs like Gizmodo and TechCrunch.